My father and I did not create the panels for the veteran’s monument in chronological order. We built them in order as follows; Vietnam, WWII, WWI, Korea, and finally the Persian Gulf. There are portions that I worked on alone, as well as portions he worked on alone. But most of the work was created together, side by side. The most exciting part of working on any piece of artwork is watching it come into reality as you progress. 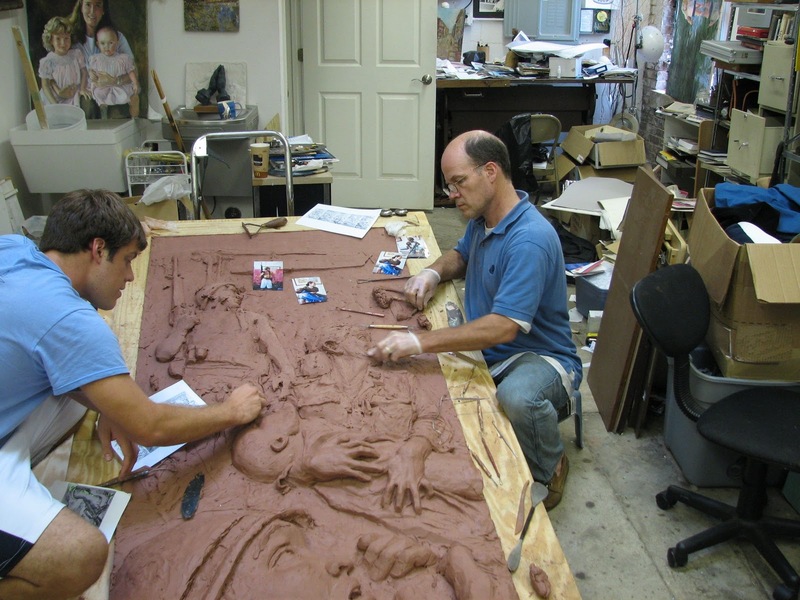 The average time spent on a 7’x3′ clay panel was 2-2.5 months. Though the sculpting process and attention to detail took a long time to complete, before we knew it we had five clay panels complete. 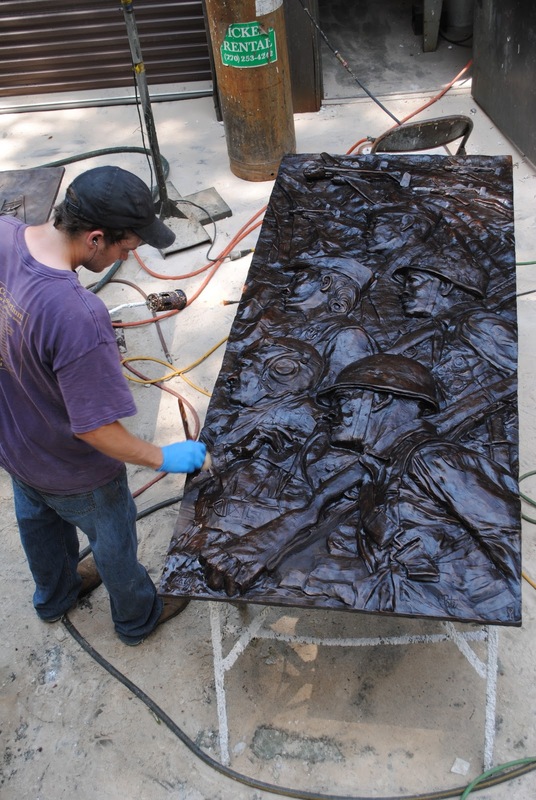 Once complete, we shipped the work to the Inferno Art Foundry in Union City, GA. There the casting would begin. Each panel, consisting of wood, clay and paper, weighed about 500 lbs. Fortunately, the foundry had a forklift. No more lifting for me!! The first step in the casting process is to paint the entire project with several layers of rubber. Every detail is captured by the rubber down to the artists finger print. Then a plaster cast is made on the outside of the rubber. Once dry the plaster is sawed into sections and the rubber is peeled off. 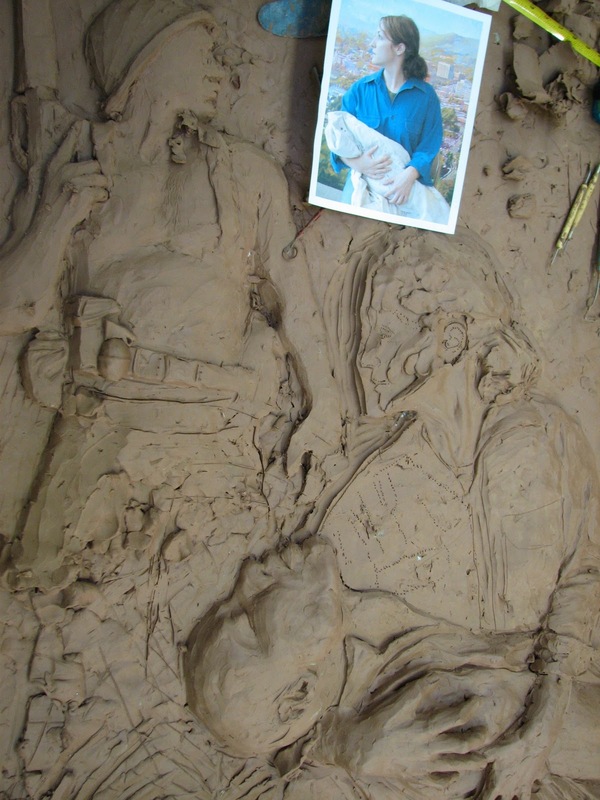 The clay that I use is an oil based, non-hardening plasteline. So, after the rubber mold is opened, the clay is removed, returned to me, cut into small pieces, and reused for future projects. The hollow mold is then put back together and filled with wax. This is what the wax cast looks like. In Atlanta we approved the wax version of the final piece. The wax is then cover in a ceramic shell. The shell has vent holes at the top and bottom. The entire piece is heated and the wax melts and flows out of these holes, leaving the empty ceramic shell. The craftsmen at the Inferno heat bronze in a crucible to over 2000 degrees. The bronze is then poured back into the holes in the plaster shell. The shell is cut away and out comes our bronze sculpture. The piece still requires welding at the seams and polishing in rough areas. For the last step a patina is added. Patina is the tarnish that gives the bronze a certain color.